Love with Food is a monthly snack and food sampling subscription box. They send only natural and organic snacks and donate a meal to charity for each box sold. They offer a smaller tasting box with 8+ snacks per month, a deluxe box with 16-20 snacks per month, and a gluten-free box with 10-15 gluten-free snacks per month. This review is for the Tasting Box, which is $9.99 a month. The Cost: $9.99 a month for the Tasting box. Free U.S. shipping. $3.99 International shipping. 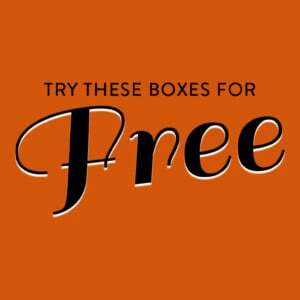 Limited Time Deal: Now through 6/30, use this link to get a FREE $20-value bonus box with any subscription of 6-months or longer, plus use coupon code SASS18 to save an additional $10 off their Tasting, Gluten Free or Deluxe plans. Ships to: The US (for free), US territories, and APO/FPO/DPO addresses. Ships internationally for $3.99. May’s theme is “Thrive” – a nod to all the strong caring people in the world that have helped you reach your goals. I found this to be extra fitting for Mother’s Day month! This box also came with a few coupons (Wayfair, BOU Bouillon Cubes, and Sun Basket). The BOU coupon even included a yummy cauliflower rice recipe! This little rice crispy treat is dairy-free, gluten-free, GMO-Free, Kosher, Nut-Free, Organic, Vegan, Vegetarian, Wheat-Free, and DELICIOUS! I gobbled this right up, and it tastes almost exactly like a homemade rice crispy treat made in my kitchen. I loved the soft texture, and was amazed to learn about the hidden vegetables (seriously, you would never guess broccoli came anywhere near this treat!) Genius! Consider this added to my Amazon Prime list immediately. Dried cherries are some of my favorites snacks ever – and I was excited to get a snack size bag of these. They were plumper than most of the other cherries that I have sampled and had a very luxurious mouthfeel. I ate the whole bag instantly. Raisin’s move over, there’s a new sheriff in town. When I was eating this item, I had no idea that it was passion fruit. I would have guessed salted caramel – for sure. To me, this was my least favorite treat of the bunch. For one, it was sticky and clingy to the wrapper. But, I just felt that it was an odd taste and although I picked up on sweet, salty, and all of the other mentioned flavors, it just didn’t work for me. I absolutely loved these! Although I’m not a fan of the smell of dried mango, I quickly got past that when I ate this delicious, healthy fruit roll-up! The texture was great, and loved the coin size bits to really stretch out this sweet and tangy treat. I loved the idea of getting a rosemary and sea salt chip – but I couldn’t get over the fact that these were pork rinds. My husband LOVES pork rinds so they’re always in the house (he also follows the Keto diet) – but they’re just not my thing. He thought that these were fantastic and raved about the flavor and texture, but I couldn’t get past the whole pork rind thing – it’s mental, but just not my thing! Yum! These chocolate filled wafers were the perfect afternoon treat with my coffee. They were flaky, flavorful, and the little square was the perfect size to take the edge off my afternoon. I forgot to take a picture of this before I drank it, but it looked just like chocolate milk in my glass. This chocolate & coffee flavored protein powder was drinkable, but not great tasting. It wasn’t sweet at all, and although it was mixed with water still a thick and creamy texture. It was not chalky, and it quickly shook up to be super smooth. It has 15g of vegan protein, 90 calories per serving, no dairy, no soy, and gluten-free. If you like a healthy, plant-based, non-sweet protein drink I’d recommend giving this a try. I think you’ll like it! The Verdict: Love with Food Tasting is a great way to be introduced to new snacks and brands that you might not find at your local grocery store (I’m excited to learn that the cherries are carried in mine!) Out of the 7 items that I received, I really liked 4 of them. I think that’s pretty good for a tasting box intended to introduce you to new snacks! Can I still get this box if I sign up today? If you order today, you will receive the June box. Coupon – Get 40% off your first box! no coupon required, just use this link. Value Breakdown: This box is $9.99 a month with free shipping. I received a total of 7 snacks which averages out to $1.43 per snack. Check out all of our Love with Food reviews and the Food Subscription Box Directory! What was your favorite snack from the Love with Food Tasting Box? Actually I think the salt water taffy was worse than the pork rinds. I read up on the taffy after trying it and almost vomiting from the flavor (my family and I tasted no passion fruit, tasted like Chinese food. A crab Rangoon in salt water taffy form 🤢) I respect that the company is vegan and vegetarian and all that. I understand it is hard to meet those requirements and still keep a good flavor but I don’t think it would’ve been that hard to keep like a plain vanilla flavor or something. Props to the company for trying something new but I’ve read a lot of reviews on this taffy. I haven’t read one saying a family/person enjoyed it. The love with food subscription is amazing. 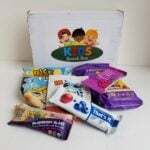 So glad I got it for my family I bought a subscription for my parents and younger brother too I have so much fun opening these boxes each month and finding new snacks to enjoy with my kids and husband. Their review process/ rewards program is amazing they really do make it easy to review and you can order favorite snacks from the rewards pantry. One of my favorite sub boxes out there. Even if you hated everything in the box you still get to review it and get points back (with the variety I find that hard to believe unless you have serious food restrictions) these boxes include a little something for everyone I love it. I was thinking about getting this box until I read that about the pork rinds, yuck! I would have suffered a stroke seeing that inside a box. I am a vegetarian.